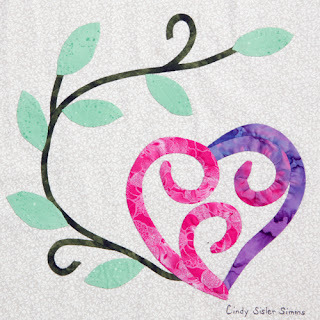 Cindy Simms Quilt Designs: Quiltmaker's 100 Blocks Vol 6 blog tour !!! I think I just found my favorite block! LOVE IT!!! What a pretty block! I love it! That is a lovely block. The wall hanging using the block turns out very graceful! Fun block, the wall hanging is very nice. I love pretty blocks and quilts and that's what you have made. The flowers in the wall hanging add the right touch. Very nice block. Simple and versatile-good combination. And, from someone who has an aversion to applique-I will probably try this block as I do really like it! not only is your block pretty, I'm glad amazed to know that you have been in love with quilting for 55 years! Great block! I think I would add tulips or roses to it. Thanks for sharing! Your block is beautiful - it has such great movement in it! Thanks for sharing and for the chance to win a copy of the magazine. Very nice block. thanks for sharing. That is one cool and interesting block! Wonderful block! Can't wait to try it! Love the swirly goodness of your block! Very nice. Love the swirls in your block. Very sweet. Your background quilting is very effective. Thanks for the chance to win! What a neat applique idea! It is so pretty the way you clustered the design repeat. I think it would make a great baby girl blanket. What a wonderful and lovely block. I wish I knew how to applique. Beautiful block and the fabrics couldn't be more perfect. Thank you. Wonderful block and I like the quilt you designed with the flowers too. That would make such a nice gift for a wedding. Very graceful. Thank you for encouraging us to make it our own by adding our own flowers :) Sometimes, we see something and just reproduce without the creative push to make it our own. Congrats on being in the 100. You are a very talented designer. What a beautiful block indeed. Could be a quilt or a wallhanging. Both great ideas. Any colors you want - so easy and versatile. Thank you for sharing and giving all of a chance to win our very own copy. Your block and quilt are beautiful. I love using bias tape for applique, so I will definitely try this. Thanks for the chance to win! Hope you are well on the road to quilting again--thanks for sharing your ideas with us. Such a pretty block! I've just been getting into appliqueing and would love to try this one. The thought of your granddaughter picking names out of a hat makes me smile. Talk about the personal touch! What a great block. Love the flow. Applique is always a challenge for me, but bias tape I can do! I like the simplicity of your block and the space to add our own flowers. Just learning to do applique and so far so good! I am going to try my hand at your block! I just love it! Would make a great pillow!! Gosh I love this; makes me think I need another valentine quilt. This block is so sweet, I love it in multiples, too! Your block is lovely. So glad that you are doing well and were able to submit your entry-congratulations on being selected. A lovely block. The wallhanging would be a nice wedding gift, I think! Beautiful! This has been such an inspiring blog hop but I think your block may be my favorite so far! Very pretty and feminine--perfect for my little nieces! My comment: Just lovely. You did a great job. Congrats and enjoy your trip. Thanks for the chance to win. hanging is great. Thanks for the opportunity to win. I really do love this block. . .the best of the day! Thanks so much for sharing. Your block is very sweet and I like the idea of adding whichever flower you like. Very pretty -and I like the dimensionality of the flowers on the wall hanging. I love the delicateness of your block! I love the outlay of your block and the hearts are great. The wall hanging looks great and I like how the flowers add to the overall design. I really LOVE this sweet little heart block and the wall hanging. Congrats on your block in the book! I want to win. LOVE your block! Congratulations on getting in the magazine! I never would have thought it was bias tape. I guess I "saw" reverse applique. Very pretty. I enjoyed seeing your block and it inspires me to get busy on a Spring Quilt. If I start now maybe it would be finished by then. Lovely block and I really like the quilt you made with it. Congratulations and thanks for the opportunity to win. Your block is absolutely beautiful. I can't wait to try this block. I bought some bias bars awhile back and haven't used them yet so I'm thinking this might be the perfect thing to try. Sorry about the health scare last year but congratulations on getting your block included in this years' 100 Blocks. Thank you for an enjoyable visit to see your block, and the inspiration to get cracking on quilting. Really like the wall hanging. I like how you rotated the blocks. These lovely little hearts are something I could see my mom liking. Thank you for sharing. 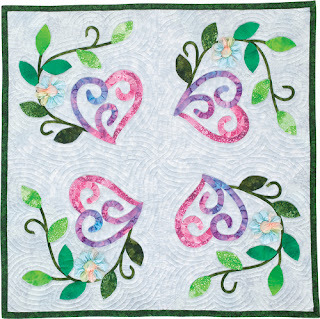 Wonderful block to wrap those you love in Love or as an addition to a hearts and flowers quilt! Awesome block and love the pattern on the whole quilt! Your block and wallhanging are beautiful! I'm so excited to get this magazine and will buy it if I don't win. There are so many great blocks in it. Thanks for the chance to win. Love your block! Applique is something I really enjoy. I love that your block is so versitile. Congratulations on having your block published. ps. Thank you and your husband for your military service. My Dad was career Air Force and my son is currently deployed in Afghanistan with the US Marine Corps. The block alone is beautiful but it looks wonderful in your wall hanging with the addition of flowers. So sweet and pretty! Reminds me of Celtic designs, and filligree, which I love! Thank you for showing us a quilt design option! Love the simplicity of the block! Congrats on being included in the issue! Thats a really pretty block, and I love the personallization feature of it. Congrats and thanks for the chance! I really like your block. It's so soft and sweet. It would be lovely made into a pillow for my niece's bed. Congratulations for having your block published in Quiltmakers 100 Blocks and thanks for the chance to win a copy of it! This is a beautiful block and would look beautiful mixed with other floral designs or as a single mini quilt to give to someone. I like your idea of using hearts as flowers, hope you dont mind if I do the same! I hope to win so I can make your beautiful wallhanging! What a beautiful block and wall hanging! Thanks for the chance. My contact info is linked to my name. Your block is so pretty. great idea to add your favorite flowers. thanks for a chance to win your giveaway. Your block is so sweet and that wall hanging would make a great wedding gift! PS - hope all those health issues are thing of the past for you and all is well now. Such a pretty block and I love the colors you have used. Love your block, and the wallhanging is just wonderful! Love the block, just beautiful. Awesome wall hanging. I love flowers and can see lots of possibilities for your block in a project. Love the colors in batiks!! Thanks for participating in the blog hop. Take care. Your block is so pretty - I'm inspired to tackle some applique! Very sweet and charming! I love it! Lovely block, nice soft colors. Thank-you! I love your block! So many ways to use it! Love it, can see so many different flowers on the vine and more than one place that would work on the vine for multiple blooms. The block if fine without the flower. I might make some and set them on the wall and see what I think before I put flowers - I might use birds instead. I'm hearting your hearts! Wonderful block. Your block is so beautiful. Thank you for your inspiration. Your block is beautiful, I love the addition of the flowers in the wall hanging. Lovely block. The scrolls add a lyrical touch. Thanks for the giveaway. Thanks Cindy for a chance at the give-away! Your block is fabulous & definitely one I would like to construct! Your block is beautiful! It is definitely one I want to make. Congratulations on being in the magazine. Artistic and a lovely block. I wish I liked to applique. I love your block and quilt. The colors are so soothing and pretty. I'm glad your health has improved. Your block is lovely, would make a great wall hanging. Awesome quilt hanging! Congrats on the block! Lovely block! Thanks for the chance to win a copy of 100 Blocks! I really like the fact that your block is a "modify it" block! It is really pretty, and I can imagine a lot of possibilities for it. I hope you are in good health now! Your block is very special, for it allows for personalization. That is a great idea! Love the beautiful block and wall hanging. Really nice quilting on the wall hanging! What a beautifull wallhanging for spring! This block would make a wonderful wall hanging for February. Thank you for the chance! Very pretty. And I love the fabric you used. What a delicate design; almost ethereal. I like it a lot. What a pretty little block, I like it even more with the flowers you added. What a lovely block and makes a wonderful wallhanging. Thanks for sharing and for your giveaway. I would love to make this for Valentines Day! It's very pretty. What a pretty block! I like the colors you made it in. I'm glad that you are able to sew and blog again. Your block is very pretty. I hope you are doing well since your health scare. Your heart block is gorgeous, especially in the colors shown here. Congratulations on having your block published! It is very pretty. Thanks for the chance to win! Beautiful block and wall hanging! I enjoy applique and will enjoy making this block. 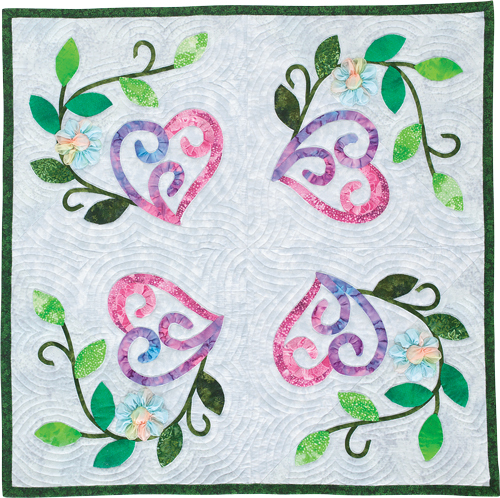 I'm partial to heart patterns and hand applique, so of course I love your block! Your block is so sweet. I really love it. your block is unique and great that you show how to make it even more unique. Thanks for all the work you put in to creating it for us to enjoy. I really like the different shape of the hearts. Love that we can add our own flower design in this. This is a nice block. thanks for sharing. I love your design! Thanks for the chance to win. What a happy little block. I love it. I love your cute block! congrats! What a pretty block!! Thanks for this opportunity!